Linköping, Sweden and Shelton, CT – October 25, 2018 – International medical imaging IT and cybersecurity company Sectra (STO: SECT B) will install its enterprise imaging solution, for both radiology and cardiology, throughout Deaconess Health System. Integration between Sectra and the Epic EMR will ensure efficient workflow and physician access to all patient images and information within the healthcare system. “A PACS is a lifeline of a health system. Everyday tasks, including importing/exporting patient studies, helping referring physicians easily view images, and high-level analysis by radiologists—all are more easily implemented by partnering with a proven company. For us, Sectra is the market leader in PACS, and we are delighted to start our relationship with the best team in PACS performance,” says Ryan Meyer, MD, Chief, Department of Radiology at Deaconess Health System. Sectra’s enterprise imaging platform provides a unified imaging strategy for high production environments and will support Deaconess Health System’s patient care at seven hospitals, a freestanding cancer center and 30 additional care sites throughout 26 counties in Indiana, Kentucky, and Illinois. The consolidation of all imaging within the health network will provide workload balancing and speed up communication between radiology, cardiology and referring departments. 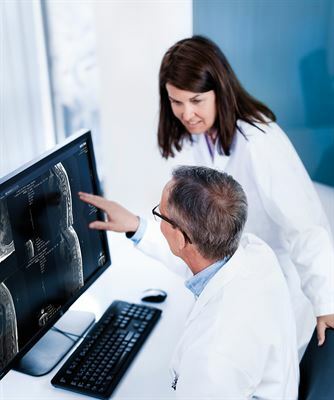 In addition to Sectra PACS for diagnostic radiology and cardiology, the contract signed in September includes 3D advanced visualization tools, Sectra Breast Imaging for mammography workflow, teaching file software and Sectra’s universal image viewer. Sectra’s solutions for enterprise imaging will be showcased at RSNA in booth #6113. Read more and book a meeting with Sectra at RSNA.